Each week, I'll be doing an in-depth scouting report on the Patriots opponent, going over their tendencies, strengths and weaknesses in all three phases of the game. This week, the Pats will look to get back into the win column after suffering their first loss of the year last week in Denver. Not only are the Pats at home, but they host the floundering Philadelphia Eagles, who have lost four of their last five amid rumors of locker room discontent under Chip Kelly. We'll see if the Eagles show some pride and fight after dropping their past two games by a combined 54 points, particularly against a Pats team that historically has been far less formidable without Rob Gronkowski. 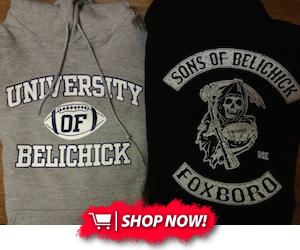 Lets take a look at the Gronk-less matchups that will unfold this week. It's surprisingly been a slog this year for Chip Kelly's famed spread offense. Despite ranking 12th in the league in yards gained (likely due to their high volume of total plays run), they rank 20th in scoring with just 22.1 points per game. Turnovers have played a huge factor, as only three teams have coughed it up more than their 21 giveaways, but the biggest disappointment this year has been their inconsistent running game. 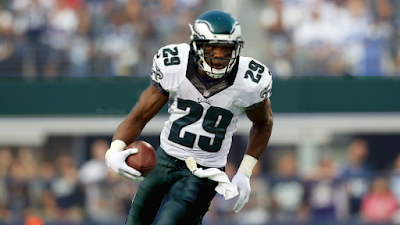 The running game had been key to Kelly's offense in past seasons, but this year has managed a middle-of-the-pack 4 yards per carry, with high-priced free agent DeMarco Murray (3.5 ypc) particularly struggling. With effective change of pace back Ryan Matthews looking unlikely to play after missing practice all week under the league's concussion protocol, Murray will likely get the lion's share of the carries this week. Stopping him will be key: the Eagles have rushed for an average of 159.7 yards per game in their four wins, but just 88.7 yards per game in their seven losses. At his best, the 6'0", 214 pound Murray is load to bring down, with a size/speed combination that makes him a nightmare to tackle once he gets forward momentum going. The Patriots secondary has been excellent at tackling throughout the season, but missed plenty of tackles in last week's disappointing performance, and they'll face a challenge in redeeming themselves against Murray. The Patriots normally ferocious run defense will look to bounce back from their worst performance of the year, with much of Denver's damage done after Dont'a Hightower left with an MCL sprain. Hightower's status is up in the air, as he's practiced all week on a limited basis, but I'd expect the team to err on the side of caution with such an important cog to their defense. It is looking likely that the run defense gets a boost from the return of Jamie Collins, who sounds optimistic about taking the field for the first time since getting mysteriously scratched with an "illness" four weeks ago. They'll also need better tackling from the secondary, who had been sure tacklers all season before struggling mightily in the Denver meltdown. It's also worth noting that the Eagles use many of the same stretch zone blocking concepts that gave the Pats so much trouble in Denver. The Eagles could be getting a big boost with a return from the injured list as well, as All Pro left tackle Jason Peters is expected to play for the first time since exiting the team's week 7 loss to Carolina with a back injury. His absence had a devastating ripple effect across the line, as starting right tackle Lane Johnson struggled with the move to the blind side and third tackle Dennis Kelly looked like a backup in over his head. Peters is one of the league's best in pass protection, and his athleticism and ability to reach defenders at the second level is a key to the Eagles running game. He'll pose a challenge for Chandler Jones, Jabaal Sheard and the rest of the Patriots productive group of edge rushers. With Peters return allowing Johnson to return to his natural right tackle position, the Eagles line starts to look better. Johnson was out of place at left tackle, but is one of the better right tackles in the league, with his physicality as a run blocker standing out. With center Jason Kelce rounding into form after a rough start to the season, the Eagles have three studs upfront. The issue has been the guys between those three, as guard play has killed the offense all season long. Simply put, the Eagles didn't have a backup plan for the self-inflicted offseason loss of Evan Mathis, who had emerged as one of the league's top run blockers at the position with the Eagles. In his place, the Eagles have turned to Matt Tobin and Alan Barbre, a duo that has been downright horrendous in pass protection. This would be a matchup for Dominique Easley to feast on, but the Patriots defensive tackle appears unlikely to play himself after missing practice all week with a bad ankle. Instead, I could see the Pats taking advantage of those weak links by moving Jones or Sheard inside on some passing downs, where they'll have major mismatches against either guard. Big Alan Branch, who is coming off of his best game as a Patriot, could also feast against these guys. 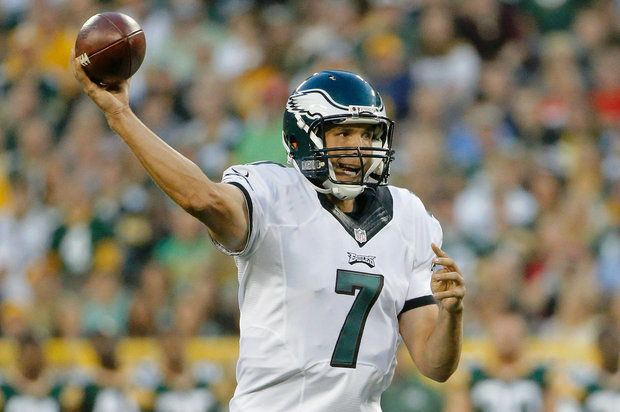 Getting pressure will be key to stopping whoever plays quarterback this Sunday for the Eagles. On that front, it's looking increasingly likely that Sam Bradford will be making his return to the lineup after missing the past two games with a concussion and shoulder injury. Mark Sanchez started the last two games in his stead, but produced remarkably similar numbers. As you can see, both have been interception-prone, and neither have done a good job of pushing the ball down the field. Protection issues haven't helped the quarterback play, but the Eagles receivers also haven't stepped up to their high expectations. Jordan Matthews in particular hasn't made the sophomore leap many were expecting from him. Despite a team-leading 89 targets, Matthews has only topped 80 receiving yards three times this season, equalling his number of touchdowns. At 6'3" and 212 pounds, his size is noteworthy, particularly for a receiver who spends much of his time operating out of the slot. He could see plenty of Logan Ryan on Sunday, who is coming off of a career game against another big bodied receiver in Demaryius Thomas and has plenty of experience in the slot from past seasons. If snap counts are to be believed, first round rookie Nelson Agholor remains the other starting receiver despite a stunning lack of production. A rumored target of the Patriots back in last spring's draft, Agholor has the explosive quickness and excellent route-running ability to be a playmaker, but he's yet to translate those skills into consistent production. Despite starting 7 of the 8 games he's been active (he missed a chunk of time with a shin injury), Agholor has only managed 16 catches for 163 yards all season. He still could see a decent amount of Malcolm Butler, particularly when the Eagles go three-wide. Third receiver duties for the Eagles have been split between the uninspiring trio of Riley Cooper, Josh Huff and Miles Austin. Of those three, Huff has been the most explosive and reliable, catching 69% of his targets and tying for the team leading in receiving touchdowns with 3 despite seeing only 29 targets all season. His run after the catch ability makes him a dangerous player in space. Cooper and Austin have seen the vast majority of their targets deeper down the field, resulting in high yards per catch averages (17.5 for Cooper, 17.2 for Austin) but miserable catch percentages (53.6% for Cooper, 41.9% for Austin). Patriots nickel corner Justin Coleman has yet to return to practice from his hand injury, but this looks like another matchup the Pats will be able to survive by playing a safety in that role. Given the Eagles desire to run the ball, it could be Tavon Wilson this week, who played that role well against the similarly run-heavy Bills. Playing Wilson as the nickel corner would have an additional benefit of freeing up Patrick Chung for tight end duty. 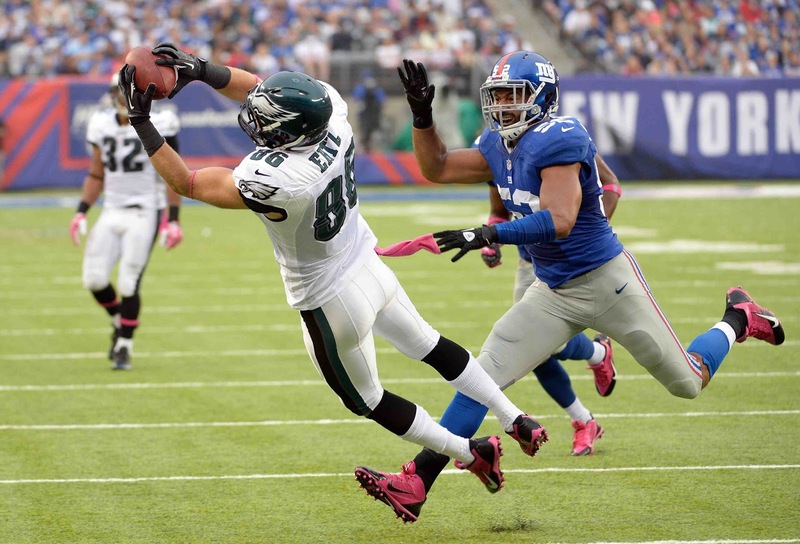 It's a role Chung has excelled in all season and an important one this week, as the Eagles boast a talented duo in Zach Ertz and Brent Celek. A high second round pick from 2013, Ertz is a big, explosive passing game mismatch whose statistics don't do justice to how well he's played this year (he's currently ProFootballFocus' fourth highest graded tight end). Ertz missed the Eagles Thanksgiving game with a concussion, but he's been a full participant in practice and should be all systems go on Sunday. The bruising Celek is best known for his excellent blocking, but he's a capable possession receiver who flashed that ability with an 11 catch, 213 yard two game stretch over weeks 10 and 11. Chung will likely face one of the tougher assignments he's taken on all year in Ertz, while Celek will likely be assigned to the Patriots linebackers. The Eagles passing game is also complimented well by their running backs, all of whom can do damage catching the ball out of the backfield. Murray is best known as a bruising downhill runner, but he's currently third on the Eagles in receiving yards (295) and second in receptions (39). His powerful running style makes him very tough to bring down on screen passes, where the Eagles athletic line does a good job of getting blockers down the field. Even more dangerous is Darren Sproles, who has carved out a fantastic career as arguably the best passing down "scatback" of his era. Sproles' explosive quickness makes him a major coverage mismatch out the backfield, which figures to make him a focal point of the Pats defense when he enters the game. Things haven't been much better for an Eagles defense that ranks in the bottom third of the league in nearly every major statistical category: yards (4,174, 25th), scoring (24.9 ppg, 23rd), first downs (237, 25th) and opponents yards per carry (4.4, 25th). It's not a defense without talent, particularly on the defensive line, but there are major holes on this defensive roster that have more than undone their strengths this season. 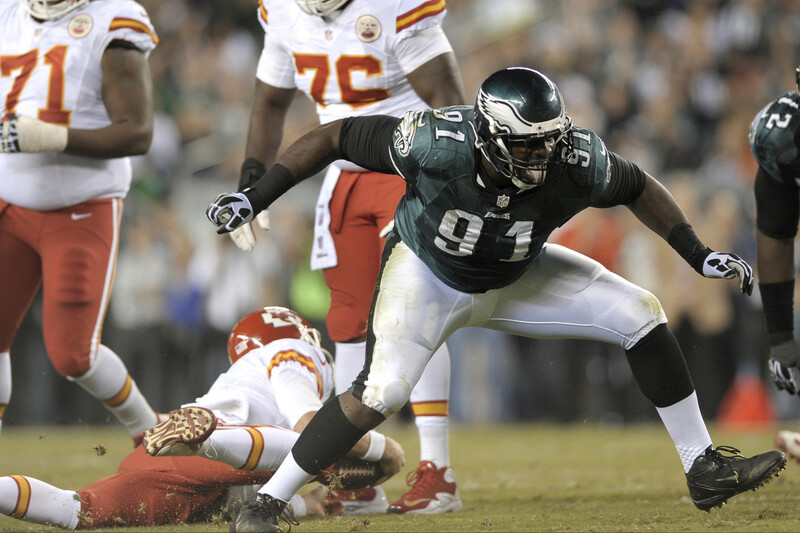 The best player on this Eagles defense is Fletcher Cox, a former high first round pick who has absolutely blossomed in his fourth season. Cox has already tied his career high with 5.5 sacks, a number that doesn't do justice to the sheer amount of disruption he's brought from his interior 3-4 end position. Despite being a bit undersized compared to the protypical 3-4 end (he's listed at 6'4" and 300 pounds), Cox has also brought stout play against the run, where he uses his quickness well. He'll be a problematic matchup in protection, particularly for Shaq Mason, who has struggled at times both with quickness and advanced pass rushing moves. Cox is merely the headliner of this deep group. Vinny Curry was a second round pick from the same draft that landed Cox, and he's developed into a rock solid starter at the other end spot. Unlike Cox, Curry is mostly used on passing downs (he's only played 34 snaps against the run all season), and the 9 sack, 4 forced fumble season he turned in last year illustrates his abilities as an interior rusher. Curry's statistical production is down this year (only 3.5 sacks) but he's still brought plenty of disruption, as evidenced by the 14th highest pass rushing grade for interior defenders on PFF. Cedric Thornton joins the rotation on early downs, where he's brought solid run defense to the mix, but he's questionable this week with an ankle injury. The Eagles might be having a poor season defending the run, but it's hard to pin that on nose tackle Bennie Logan. Logan has had minimal impact as a pass rusher, but he owns the ninth highest run defense grade amongst interior linemen from PFF. Instead, it's been poor play from an undersized linebacking group that has done this run defense in. Both Kiko Alonso and DeMeco Ryans are above-average coverage linebackers, but both have had major struggles plugging gaps against the run. With impressive rookie Jordan Hicks lost for the season, those two will have to step up their game when/if the Pats attempt to run at their nickel defense. Mychal Kendricks is bigger and more physical, and thus a far more effective downhill player both against the run and as a pass rusher. However, he can be victimized in coverage against the wrong matchup. The Patriots haven't been a good rushing team this year, but their last good performance on the ground came against a Redskins team that also had two undersized struggling linebackers. It will be interesting to see if the Pats can replicate that success, with the ability of Shaq Mason to get to those linebackers at the second level being a key. While the middle of the linebacking core is weak, the Eagles bring a strong duo to the edges in Connor Barwin and Brandon Graham. Playing as a full-time, every-down starter for the first time in his career, Graham hasn't necessarily had the statistical breakthrough that some were predicting for him after excelling in a sub rushing role earlier in his career, but the former first round pick has been rock-solid both as an edge setter in the run game and as a pass rusher. His 4.5 sacks don't due his pass rushing justice, and he also ties Cox and safety Malcolm Jenkins for the team lead with 3 forced fumbles. Barwin's versatility makes him a unique chess piece for this defense, as he's the rare linebacker who can cover, rush the passer and defend the run well. He's had an uncharacteristic down year against the run in 2015, but his pass rushing and coverage ability remains strong. The Patriots may be down several weapons in the passing game, but they can take solace knowing that they'll be attacking one of the worst cornerback groups in all of football. An already poor group got even worse on Thanksgiving, as starter Nolan Carroll was lost for the season with a broken ankle. That will likely lead to second round rookie Eric Rowe getting promoted to a starting role outside opposite Byron Maxwell, with EJ Biggers remaining in his slot corner role. Rowe played well in his first career start back in week 4 (against the Redskins) but he struggled when Carroll's injury forced him into action against the monstrous Megatron on Thanksgiving. Hard to judge the rookie for that. The Pats were rumored to have interest in him leading up to last spring's draft, but the Eagles traded up to ensure they landed a player whose length and physicality made him an excellent fit for their preferred press coverage. The Eagles projected that Maxwell would develop into a number one corner in their system, and paid him like one to pry him away from his comfy number two role opposite Richard Sherman in Seattle. To say that hasn't worked out would be an understatement, as Maxwell has repeatedly been torched by the number one receivers he's had to face in that role. The Patriots, of course, don't have their number one receiver at the moment, but Brandon LaFell ccould get plenty of targets whether Maxwell or Rowe is lined up across from him. Both of those corners bring above average size and physicality to the position, which could make Brady's staple quick sideline screen to JoJo a tougher play to execute, but LaFell has the speed to beat either one of them deep. Keeping Biggers in the slot is probably needed, as both Rowe and Maxwell are at their best when they can use thier physicality to hem their receiver towards the sideline. However, if Danny Amendola does make his return to the lineup, it will mean plenty of matchups featuring the Patriots best healthy receiver against the Eagles third corner. Amendola figures to see plenty of targets regardless of matchup if he's out there, and the potential mismatch against Biggers should have both Brady and Amendola's fantasy owners licking their chops. While the Eagles don't have strong corner play, their starting safety duo of Malcolm Jenkins and Walter Thurmond has been amongst the league's best. Both are converted cornerbacks whose prior man coverage experience makes them well-above average for the safety position. They've also shown a willingness to mix it up all year on run defense, combining for an impressive 5 forced fumbles. Their presence will make it an interesting game to start what figures to be a multi-week Gronkless stretch. Scott Chandler figures to see more targets in Gronk's absence, but the length and coverage ability of both safeties could make it a difficult week for him to make a real statistical difference. In fact, while the Eagles corner play has been poor, the coverage range of the safeties and linebackers is well above average. The Pats have long favored attacking linebackers and safeties in coverage with mismatch creators like Dion Lewis and Gronk from their backs and tight ends (isolating Denver's linebackers in coverage was a focal point of last week's game plan). Without a dynamic playmaker from either position group, it could be a good week to turn from that approach and get the receivers more involved, with Keshawn Martin perhaps getting a chance to break out with a week under his belt and a far less formidable group of corners lined up across from him. The Patriots ability to protect Brady will be key for such an approach to work and, despite some late game hiccups against Von Miller, the Pats line overall held up better than one could expect against Denver's vaunted pass rush. The play of Marcus Cannon at right tackle will be key, as he looked far better on the right side against Denver than he did playing left tackle against Buffalo. He's still the weak link on the Pats line, but recapturing his strong 2013 play at right tackle would go a long way towards solidifying a backsliding offense. Finally, taking care of the ball will be key this week, as the Eagles defense is amongst the league's best at creating turnovers. Only three teams have forced more turnovers than the Eagles (21), who are amongst the top 10 in the league in both interceptions (12, 8th) and fumble recoveries (9, 6th). With three players with 3 forced fumbles (Cox, Graham, Jenkins), ball security will be emphasized this week. Brady will also have to be careful with his throws over the middle, as Jenkins and Thurmond form a ball-hawking duo on the backend. Bill Belichick has already publicly praised the Eagles special teams as a reason to be concerned this week, and it's easy to see why. Sproles is the headliner as one of the most prolific return specialists in NFL history, and he's been his usual dynamic self this year, running one back for an 89 yard touchdown en route to an impressive 10.9 yards per return average. Huff meanwhile has injected some explosion into the kick return game. He's yet to return one for a touchdown, but does have a 40 yard return to his name and a solid 26.1 yards per return average himself. Unsurprisingly for a head coach who has been influenced plenty by Belichick, Kelly's coverage teams have also done a good job. They've been solid covering kickoffs (23 yards per return), but downright stingy covering punts, where they've only let up 4.7 yards per return. Neither unit has allowed a touchdown. Even if Amendola is active, it's possible that he'll hand off his punt and kickoff return duties to new adddition and former Eagle Damaris Johnson. 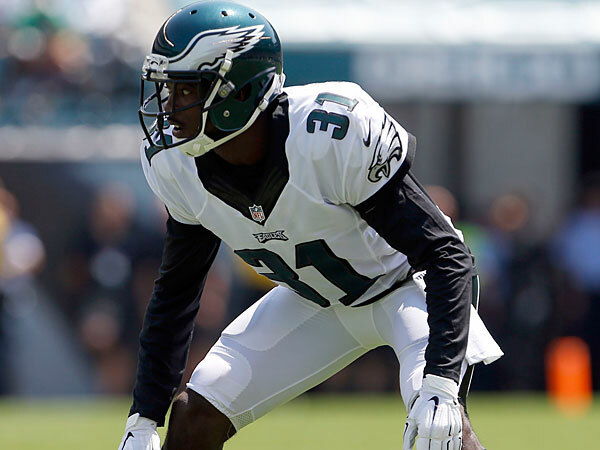 Johnson started his career with the Eagles in 2012 as an undrafted rookie in 2012 thanks largely to his return skills, which paid dividends in the form of a 98 yard punt return for a touchdown that season. Amendola leads the league in punt return average, but Johnson has the ability for the team to not lose any explosiveness in the return game while avoiding him taking any more unnecessary shots at his sprained knee. Things are less productive for the Eagles in the kicking game. Former Dolphin Caleb Sturgis has filled in for the injured Cody Parkey and been just ok, making 76.5% of his field goal attempts. He's hit only half of his attempts from 50+ yards (2-4) and has also missed two extra point attempts. Punter Donnie Jones can absolutely boom it (47.1 yards per punt), but he's already had two punts blocked this year. Will the Eagles show up? They've been blown out of their past two games, allowing 45 points to the Buccaneers and Lions each in the process. That's been the low-point so far of an extremely disappointing season that's sparked rumors that Kelly has lost his locker room. The effort-level of the Eagles bears monitoring, as they're somehow not even close to out of their division race despite a 4-7 record. From a Patriots perspective, the biggest question is how much scheme and a certain Hall of Fame quarterback can cover up for so many key players remaining out. The tentatively projected returns of Jamie Collins and Danny Amendola would bring a big boost to each unit, but this has historically been a completely different offense without Gronk. Will a combination of LaFell, Amendola and Martin be enough to keep the passing game afloat without their game-changing tight end? The injuries on the New England side narrow the gap a little bit, but this is still a team that nearly beat a very strong Denver team on the road without nearly all of those same injured players. Playing at home against an Eagles team that appears to be falling apart at the seams could be just what the doctor ordered for a team that needs to keep winning, but more importantly get healthy over the final month of the regular season. It might not be pretty, but this banged up team should have more than enough to take care of the sputtering Eagles.